Visit us at the New Ag International Convention in China! » News » Corporate news » Visit us at the New Ag International Convention in China! For the second consecutive year, Tradecorp will be participating in the 2018 New AG International Annual Conference and Exhibition. Stop by stand 3 from the 15-17th of October in Nanning, Guangxi, China to gain a better understanding of our products first hand from experienced technicians. 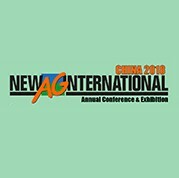 The second annual New Ag International China conference will focus on agricultural issues having to do with biostimulants, special fertilizers, irrigation, fertigation, and biocontrol. Taking place in one of the country’s largest fruit growing regions, Guangxi, the location of this convention is the ideal place for companies from every aspect of the value chain to showcase and exchange ideas. Tradecorp will be at New Ag International, Ireland!